February | 2014 | Thoughts from the Shteiblech. 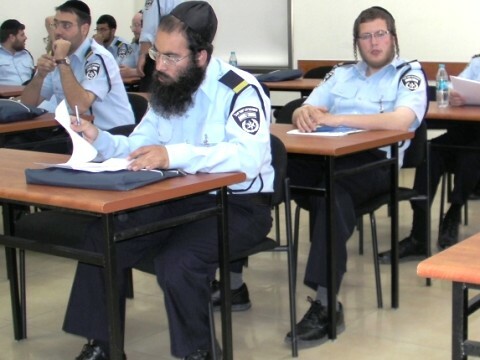 Israeli Society needs the Charedim too. Each part of the Mishkan was dependent and reliant on each other. For example, until the curtains enclosing the Chatzer were in place, the Korbanot could not be offered up on the Mizbeach. In yesterday’s Parsha, in Perek 40, we see how the Torah describes how Moshe actually put up the Mishkan and it was he who put all of its parts in place. From Perek 40, Pasuk 17, we read how the Mishkan was constructed. The erection of the Mishkan was a miracle on two levels: 1) Physically, as they had been able to design and build the Mishkan in the midbar, and 2) Spiritually, as Am Yisrael had themselves been able to create a physical object that could be a resting place for the Shechinah. The beauty and uniqueness of the Mishkan was that is was man-made. The Shechinah rested upon the toil and handiwork of man. Every Jewish man, women and child had a part in it’s construction. The Mishkan was the work of MAN. Until now, Hashem had shown them miracles and closeness. From now on, Am Yisrael would relate to Hashem differently. They would need to approach life in a natural way-‘B’Derech Hatevah’ and have to take responsibility for their own destiny. One of the messages of the Mishkan, is that of interdependence. Just like each part of the Mishkan was dependent on one another and the whole Mishkan structure wouldn’t be able to stand and function properly unless all the constituent parts were linked and connected, so too, Am Yisrael, when entering Eretz Yisrael, would need to learn how dependent they are on each other. All Jews are part of the same ‘Am Segulah’, the same Nation that has miraculously survived, despite everything. Let’s not forget that even though our views are different to them, Charedim are Jews, just like we are. We can’t make sweeping generalizations about their sector. Increasingly, they do work, go to the army and see a value in contributing to the State. The problem is with the leadership of the Charedi sector. 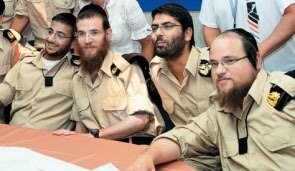 I honestly think that if given the chance, most Charedim would be willing to do some type of military or national service and certainly work, rather than be sucked up in a ‘Torah only’ Yeshiva system, that most of them don’t fit into. 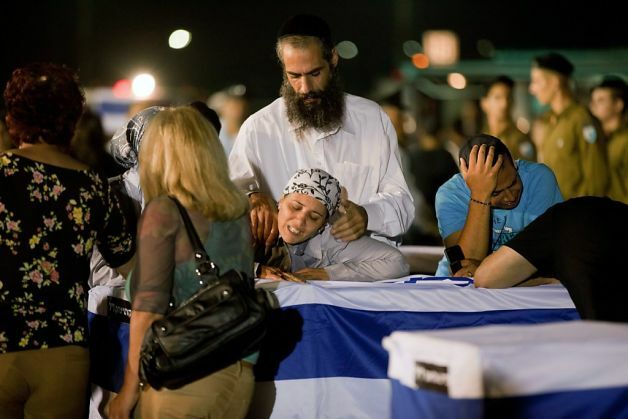 Let’s also not forget that there are sectors of the ‘Chardal’ and more right wing ‘Dati Leumi’ communities who are sadly, equally as disconnected from mainstream Israelis and the institutions of the State. How different are the views of Rav Shmuel Eliyahu or Rav Shlomo Aviner who said that the Dati Leumi community should also be demonstrating this afternoon, from the Charedi ‘Gedolim’. So, this afternoon, when the Charedim will be demonstrating in Yerushalayim and no doubt the secular press will be doing everything they can to ridicule and criticize them, don’t forget one of the messages of the Mishkan. All Jews are inextricably linked and dependent on each other. During the Shoah, the Yeshiva world was almost destroyed. Until the beginning of the Yeshivot Hesder, with Kerem B’Yavneh and then Hakotel and Har Etzion, it was the Charedi Yeshivot and Day School Movements both in Israel and abroad, who were responsible for the rebirth and mushrooming of Torah learning. The Roshei Yeshiva of the Hesder Yeshivot like Rav Goldvicht and Rav Hadari were themselves educated in the ‘Charedi’ Yeshiva system.Initiatives like Daf Ha’Yomi started within the Charedi sector. Even now, the Charedi sector outweighs by far the Dati Leumi sector with regard to Torah learning and Shmirat Ha’Mitzvot. Furthermore, if you look at the Baal Teshuva community-most of them were influenced by Charedi institutions like Aish Ha’Torah or Ohr Sameach and their Rabbanim and role models, rather than Dati Leumi or Modern Orthodox ones. I’m not Charedi and don’t approve of their attitude towards the State. But, we should bear in mind that the Charedi sector has contributed a tremendous amount to the survival of Torah and Judaism in this country. The Mesirut Nefesh, chessed and Tzniut that is central to their lifestyle, is something we can all learn from. Israeli Society needs the Charedim and has much to gain from their presence and input here, both on a spiritual and practical level. Instead of polarising the Charedi sector and treating them as misfits and outcasts, mainstream Israeli Society needs to learn to value and respect them and try to understand where they are coming from. At the same time of course, the leadership of the Charedi sector needs to completely change their stance and attitude towards the State. But I think both sides are at fault and must change their approach, for us to move forward as One People. Lessons from the Ketoret (Incense): Be Normal, Real and Human. In this week’s Parsha in Shmot 35:15 we read about the ketoret-the incense, that we also learnt about in last week’s Parsha in 30:34-38. Rav Hirsch comments that the ketoret symbolized Am Yisrael’s duty to make all their actions pleasing and acceptable to Hashem. The Arizal wrote that by learning about the ketoret, we will come to do Teshuvah both on a communal and individual level. The offering of the ketoret was the most sacred Avodah in the Bet Mikdash. As we read every morning, the ketoret was a blend of eleven herbs and balms. 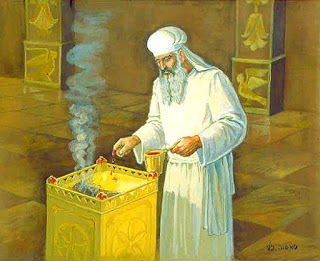 Twice daily, the ketoret was burned on the ‘Mizbach Ha’zahav’, the Golden Altar. On Yom Kippur, in addition to the regular ketoret, the Kohel Gadol would enter the Kodesh Kodashim with a pan of burning coals in his right hand, and a ladle filled with ketoret in his left; there, he would scoop the ketoret into his hands, place it over the coals, wait for the chamber to fill with the fragrant smoke of the burning incense, and leave the Kodesh Kodashim quickly. But what is the significance and meaning of the ketoret? 1) The Rambam sees the role of ketoret as logical/ practical: “Since many animals were slaughtered in the sacred place each day, their flesh butchered and burned and their intestines cleaned, its smell would doubtless have been like the smell of a slaughterhouse. Therefore G d commanded that the ketoret be burned twice a day, each morning and afternoon, to lend a pleasing fragrance to [the Holy Temple] and to the garments of those who served in it” (Moreh Nevuchim 3:45). Even though you are in the ‘Holy’ atmosphere of the Bet Mikdash, you should not neglect your human need of being comfortable and in an aesthetically pleasing environment. 2) Chassidic teaching explains that the korbanot in the Bet Mikdash represent the person’s offering of his own animal soul to G d–the subjugation of one’s natural instincts and desires to Hashem. This is the deeper significance of the bad smell emitted by the sacrifices, which the ketoret came to get ride of: the animal soul of man—which is the basic drive, common to every living creature, for self-preservation—possesses many positive traits which can be directed toward gainful ends; but it is also the source of many negative traits. When a person brings his animal self to the Bet Mikdash and offers what is best and finest in it upon the mizbeach, there is still the foul odor—the selfishness and the brutality of the animal in man—that accompanies the process. Hence the burning of the ketoret was an opportunity to destroy these animalistic traits in man. 3) I would like to suggest a third significance of the ketoret. The foul smell also represents man’s ego and arrogance which can be so self-destructive. Of course, you need a positive self-esteem and healthy ego. But, at the same time one needs to be weary that unless one’e ego is regulated, instead of serving Hashem, you actually end up manipulating your Avodat Hashem to satisfy your own ego and need for ‘kavod’ and public acceptance and approval. The pleasant smell of the ketoret cancelling out the bad odour, is symbolic of man’s awareness of the dangers of his ego and the need to temper it, if his Avodat Hashem is to be genuine and productive. 4) The Gemarah in Keritut 6b learns from the fact that the third spice listed, the ‘Chelbna’, the bad smelling spice was included, to teach us that we should incorporate in our communities and circle of friends all types of Jews, even those who are not as ‘frum’ as us. Rashi actually comments there, that we learn from this we can include sinners in our tefilot. So, the ketoret also expresses the idea of Jewish unity, that everyone, both the righteous and the sinner had an equal share in Avodat Hashem. As we are all human we all have faults and this is reflected in the Avodah of the Kohen/ Kohen Gadol in the Bet Mikdash. 5) Finally, the Gemarah in Keritut 6a and Yerushalmi in Yoma 4:5, says that if any of the spices were left out, the punishment would be the death penalty. According to Rashi in Keritut, this death penalty only applies to the ketoret of Yom Kippur offered in the Kodesh Kodashim by the Kohen Gadol. Whilst the Rambam, in Hilchot Klei Ha’Mikdash 2:8, applies this death penalty to the whole year to all Kohanim, because it is seen as ‘Ketoret Zarah’, ‘a strange incense’. So, we learn from this strict and very prescribed and detailed aspect of the ketoret, that Avodat Hashem was law based, and not based on spontaneity. This could be part of the more general function of the Mishkan, after the Egel Ha’zahav. In order to stay normal and keep our feet on the ground, we need laws and a structured religious framework, reflected in the very detailed and precise ingredients and instructions of the ketoret. So, if you were look through all these various reasons I’ve listed, I guess you can conclude that the ketoret teaches us that we need to focus on being more normal, real and human in order to reach ‘spiritual’ heights. 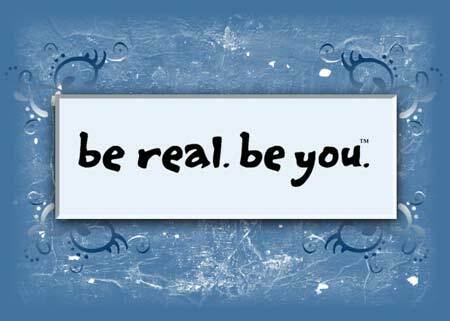 It is only by becoming more aware and proud of who we are as individuals and retaining our own sense of ‘selfhood’, that we can grow in our Avodat Hashem. Siyum on Massechet Yoma: Blood and the Avodah of the Kohen Ha’Gadol. Last night a group of us Daf Yomi geeks made a Siyum on Massechet Yoma. A few of us spoke and I discussed the significance of blood in the Avodah of the Kohen Ha’Gadol on Yom Kippur. I firstly went through Perek 16 in Vayikra which describes the Avodah of the Kohen Ha’Gadol on Yom Kippur. The Torah describes clearly the different stages of Avodah that the Kohen Ha’Gadol performed with the blood, as described in the Musaf we say on Yom Kippur. Rashi on the chumash in Vayikra chapter 16, succinctly explains the activities performed by the Kohen Ha’Gadol. The Mishna and Gemarah in the fifth chapter of Yoma, also discusses the Avodah with the blood in more detail. Firstly, the Kohel Gadol sprinkled the blood with his finger in 1 upward motion and 7 downward motions with the blood of the ‘Par’, the bull, in the Kodesh Kodashim towards the Kaporet. The blood of the bull atoned for the sins of the Kohen Gadol and his family. He then went outside the Kodesh Kodashim and sprinkled the blood, again in 1 upward motion and 7 downward finger motions toward the ‘Parochet’- the curtain seperating the Kodesh and Kodesh Kadoshim, parallel to the Kaporet in the Kodesh Kodashim. He then did the same with the blood of the ‘Sair’, the he-goat. The Sair atoned for the sins of all of Am Yisrael. Firstly, he sprinkled the blood with 1 upward finger motion and 7 downward finger motions towards the ‘Kaporet’ in the Kodesh Kodashim. He then went out of the Kodesh Kodashim and with 1 upward finger motion and 7 downward finger motions sprinkled the blood towards the Parochet. He then mixed the blood of the Par-bull and Sair-he goat and firstly dipped the mixture of blood on the four corners of the ‘Mizbach Ha’Zahav’ – the ‘Golden Altar’, and then did the same 1 upward finger motion and 7 downward finger motions with the mixture of blood, on the roof of the ‘Mizbach Ha’Zahav’. The question I looked into was, What was the significance of blood in the Avodah? What does blood reflect about the nature of Teshuva and our relationship with Hashem on Yom Kippur? 1) Rambam in Morah Nevuchim (Quoted in the Ramban, Vayikra 1:8). Other religions at the time used blood in their worship and in gaining forgiveness for sinning. To counteract and equal that, Hashem commanded us to use it as well. 2) Ramban (Vayikra 1:8) /Rashi (Vayikra 17:14). Ideally, the Ramban says, a person who sins should himself be offered up as a korban. However, as an act of chessed, Hashem allowed man to use an animal instead, in his place. The blood of the animal is therefore in place of the blood of man. Similarly, Rashi sees the blood as a expression of the need of man to do ‘Kaparah’. Both the Ramban and Rashi saw the role of blood as performing ‘Kaparah’. I suggested, from this perspective, blood represents the first level of Teshuvah – ‘Teshuvah M’Yirah’ – ‘Teshuvah from Fear’. The Sforno sees blood as the life-sustaining force in man – the ‘Koach Ha’Chayut’. Blood is what keeps man alive and represents his ‘Nefesh’. ‘Nefesh’ in Tenach is also ‘Ratzon’ – his will and desires. When the Kohel Gadol performs the Avodah with the blood on Yom Kippur, he is actually returning the ‘Nefesh’ of Am Yisrael back to their maker – he is fusing and merging the ‘Ratzon’ of man, with the ‘Ratzon’ of Hashem. He is joining and synthesizing the will of man with the will of Hashem – the ultimate expression of Mesirut Nefesh and connectedness. This, I suggested, was the second and higher level of Teshuvah – ‘Taharah’ – ‘Purification’, which is essentially ‘Teshuvah M’Ahavah’ – ‘Teshuvah from Love’. The Sforno sees blood as representing man’s dedication of his life to Hashem’s service. 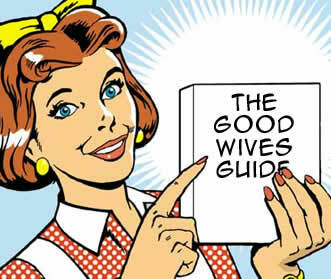 The Golden Calf: Why You Need a Wife. Rav Amital explained to Rav Dor, that in the rhelm of the Torah learning and studying it is very easy to forget who you are and get swept away in the rarified and detached environment of the Yeshiva. You are surrounded by impressionable Talmidim and like-minded Rabbaim who may also be swept up in that fervour. Therefore, you will need your wife who knows your faults and what you were like before you became a ‘Talmid Chacham’ or even a ‘Gadol Hador’ to remind you who you REALLY are. In this week’s Parsha we learn of the Egel Hazahav – the Golden Calf. If what actually happened during the sin of the Golden Calf was mass Avodah Zarah, idol worship, as the plain meaning of the text indicates, then the entire episode is incomprehensible. Why? For two reasons: Firstly, the role of Aharon in being so appeasing to the demands of the people and secondly, how could Am Yisrael have needed and worshipped the Egel after Maamad Har Sinai? The Ramban, Ibn Ezra and the Kuzari have an entirely different reading of the text. Firstly, they reason, Aharon was not a party to the Avodah Zarah. The proof being that Aharon went on to serve in the Mishkan for the next 40 years and was a partner with Moshe in leading Am Yisrael and receiving many of the Mitzvot from Hashem. Furthermore, the only aveirah that the Torah charges Aharon with is joining with Moshe in striking the stone, rather than speaking to it (Bamidbar 20:12). Secondly, Am Yisrael did not deny Hashem – they needed a replacement for Moshe NOT Hashem. The proof being, that when Moshe returned they were perfectly happy for him to destroy it. Their enthusiasm for the Egel was only because it was a substitute for their leader, Moshe. Also, the Jews who worshipped the Egel were in the minority of only three thousand-they were outsiders. My favourite explanation is that of the Beit Halevi, who asserts that their error was that the people knew that their sacrificial service was performed by a specific person, Aharon, in a specific place, the Mishkan. The people felt they had the right and need to create another such means and vehicle to channel their service – in effect, they wanted their own Mishkan that would suit their own personal and individual needs and desires, as they saw them. That, the Beit Halevi describes was their crucial error. Jews cannot custom tailor their religion or their own mishkan. The Mishkan and the sacrificial service is prescribed and defined by Hashem in the Torah and based on Divine mysteries that are way beyond human understanding. The Beit Halevi concludes that it is impossible for anyone to use the Mishkan, the Bet Hamikdash or any of the Torah’s mitzvot as the prototype for a man-made religious experience. In other words, according to the Bet Halevi, the people had lost touch with who they REALLY were. They had been swept up in the ‘spiritual experience’ of the Divine Revelation at Sinai, with all the religious excitement that went along with it and had lost touch with reality. They were unable to integrate that experience into their regular lives. So, I guess, one lesson we can learn from the Egel Hazahav episode, is that just like a man needs a wife to remind him who he REALLY is, so too, Am Yisrael also need qualified and strong leaders to remind us who we REALLY are and to keep us in line and curb our passion which can so easily become dangerous and self-destructive. 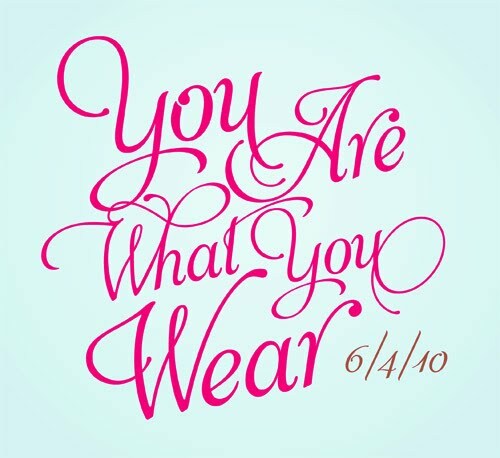 Bigdei Kehunah: What we wear affects who we become. Often in the frum world that many of us live in, there is a preoccupation with how we look and dress. I personally cannot relate to the over emphasis placed on ‘Chitzoniyut’ – your external appearance, as I think it’s what’s inside that counts and let Hashem decide how ‘frum’ we all are. I’m not talking about Tzniut, which is a Halachik requirement both on men and women-to dress (and behave) in a certain way. I’m talking beyond that. But maybe our external appearance is important and it is something we should take more time and effort thinking about and focusing on? In this week’s Parsha we read of the Bigdei Kehunah – the special clothing the Kohanim had to wear. Whilst performing the Avodah in the Bet Mikdash the Kohanim had to wear these special pieces of clothing and if they didn’t, the Avodah they performed was invalid. The special clothing of the Kohanim set them apart from the regular people. The nation had to recognize that Aaron and his sons were on a higher spiritual level and that is why they could perform the Avodah. The different clothing of the Kohanim made it apparent in the eyes of the people and onlookers that they were different, as well as reminding the Kohanim themselves that they have a unique and prescribed role. After all it’s human nature that the way we look and approach a task influences and affects how we will perform and carry it out. Furthermore, the Mefarshim discuss at length the spiritual symbolism of each of the special pieces of clothing the Kohen wore – both during the year and on Yom Kippur. During the year, the Kohen Gadol wore 8 garments and on Yom Kippur he wore 4. The regular Kohanim wore the same 4 pieces of clothing the whole year round. The Gemarah in Yoma 35b, discusses how all of the Bigdei Kehunah had to be made of materials that belonged to the people and had to have been contributed by the people for the Avodah in the Bet Mikdash. So we see there was a type of relationship between the people and the Kohanim whom they were representing. The Kohanim were not an elite, detached from the people, but rather representatives of the people. The Kohanim were not private parties separate from the people, but rather they submerged their own personalities with the nation and became the representatives of the people, raising the spiritual level of the nation. The Gemarah in Zevachim 19a teaches us that the Kohen was not allowed to wear anything, not even a bandage that wasn’t prescribed in the Torah for him to wear. So we see, the Kohanim were an intermediary between Hashem and the nation of Israel. They were representatives of the people and it was the nation, Am Yisrael, that gave them their sense of authority. The Ramban writes that the clothing of the Kohanim were to give them honour, as they were like the clothing of royalty. The Sforno says that the special clothing of the Kohanim was for the glory of Hashem, not for the Kohanim themselves. Through seeing the Bigdei Kehunah being worn by the Kohen Gadol with his would cause extra Kavod being given to him. As the teacher of the nation, the Kohen Gadol would be revered by the tribes, whose names he bore on his breast and shoulders. The Malbim explains that the special clothing worn by the Kohen Gadol signified both ‘glory’ and ‘splendor’. ‘Glory’ was due to the Kohanim as a result of their appointment of ministers of the Mishkan and later the Bet Mikdash, whilst ‘splendor’ refers to that which results from their OWN efforts. In Shmot 28:30, on the phrase, ‘On his heart’, the Sforno comments that the knowledge that the Kohen Gadol bore the names of the tribes on his heart inspired the him to daven for the welfare of the people. Which suggests that those like the Kohen Gadol who bore the responsibilty of Jewish Leadership must always have in mind those who depend on them. So, we see that yes, external appearance is very significant as it puts us in a certain frame of mind. Furthermore, it does allow us to project a certain image and let others know how we see ourselves and how we want them to perceive us. But, at the same time, as we have seen, clothing and how we appear externally is only the means. It can’t preoccupy us to the extent that we forget what the ends is-that of being better and more genuine Ovdei Hashem.